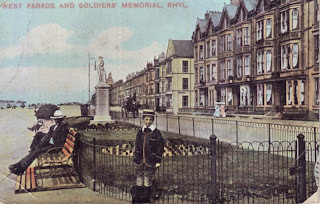 Whilst rummaging through piles of postcards in thrift stores or on market stalls some vintage postcards will catch my eye immediately; this Edwardian British seaside postcard of the West Parade and Soldiers' Memorial in Rhyl on the north coast of Wales caught my attention, because it is so rich in contemporary detail – the fashions of the day, the horse and carriage, the promenading women with parasols – but also, and most strikingly, because of the way the people in the foreground of this shot are staring directly at the photographer. The schoolboy in his high collar and boater is dressed up in his Sunday best (or maybe his school uniform, as there seems to be a satchel at his feet) and looks stiff and uncomfortable in those clothes - he is positively scowling! I love the chap sitting on the bench – his long moustache and fashionable homburg hat are so evocative of that period. Apparently Edward VII himself wore a homburg and they became all the rage. The war memorial in the background was first erected to commemorate the soldiers who had died during the second Boer War in South Africa (1899–1902). It was later moved to the Rhyl Garden of Remembrance where it is found today, although sadly, many more names of those lives lost in wars over the last century – both World War I and II and more recent military conflicts – have since been added to it. 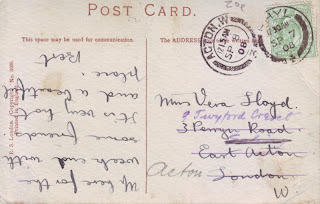 The postcard was printed in England by E.S.London from a hand coloured black and white photograph and it has a glossy finish that simulates the look of a real photograph very well. 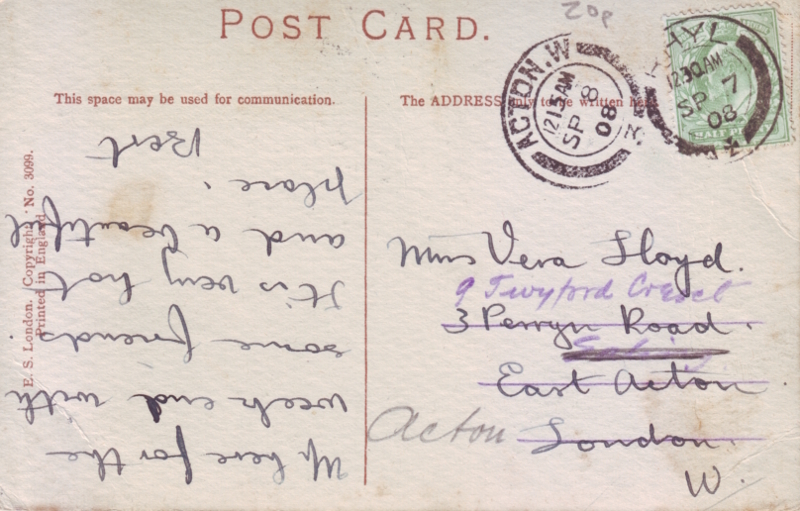 First posted on the 7 September, 1908 it was sent to the wrong address, but forwarded on to the recipient the very next day, so therefore carries two separate postal cancellations. For those of you NOT on a mobile device, here's the message to save you from having to turn your screens upside down! I've been to North Wales and I confess that it's never been very warm...but maybe 1908 was a very good year! For many people of a certain age the Principality of Monaco will be forever associated in our minds with the American actress and star of three unforgettable Alfred Hitchcock movies To Catch a Thief, Dial M for Murder and Rear Window – the timeless beauty Grace Kelly. Hollywood was rocked to its foundations when she retired from films and married Rainier III, Prince of Monaco at the peak of her career in April 1956 and became Her Serene Highness The Princess of Monaco, although the shorter title of Princess Grace was quickly adopted by fans and press alike. 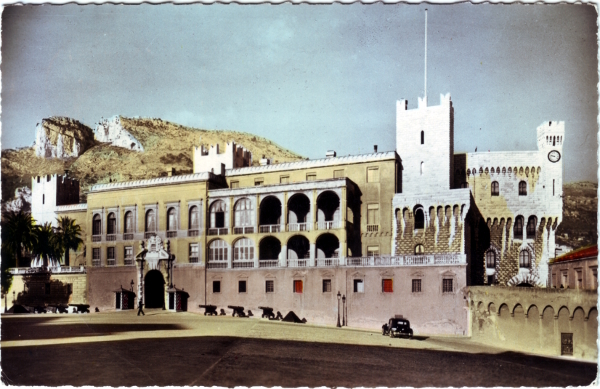 The postcard itself is a scalloped edged tinted Bromocolor real photograph card printed from a black and white original image. 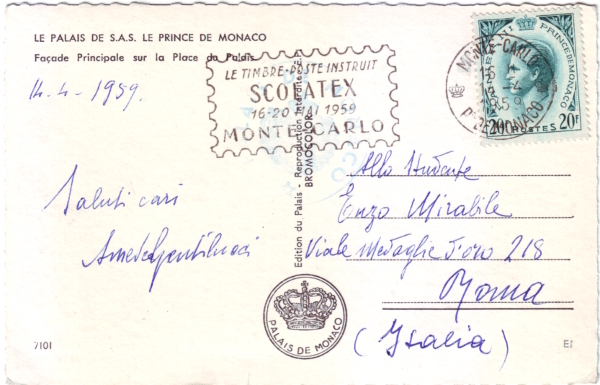 The reverse of the postcard is also interesting from a philatelic point of view – the 20 franc stamp is cancelled with a fine postmark advertising the first edition of Scolatex, an interschool and international educational philatelic exhibition which ran from 16 - 20 May 1959 – and would later become a prestigious event organised by the Monaco National Commission for Unesco. 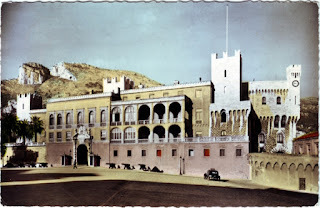 Monaco is, incidentally, the second smallest country in the world by geographical size - only the Vatican City, the walls of which I can see from where I'm sitting at my computer as I type - is smaller.